The wonderful lady second from the right is the President of Costa Rica, Laura Chinchilla Miranda. Last week, my wife and I went to see a friend who is currently living in Costa Rica. It’s a beautiful country that I find significantly more pleasant than most other Central American countries. We could drink the water in Costa Rica without experiencing any digestive issues. In addition, we actually ate food that people were selling on the side of the road, and we experienced no problems whatsoever. In fact, my favorite Costa Rican dish was queso palmito. It is essentially a ball of incredible cheese, and we bought it from a roadside vendor. Also, even though there is poverty in the country, it is not nearly as extreme as the poverty I have seen in other parts of Central America. 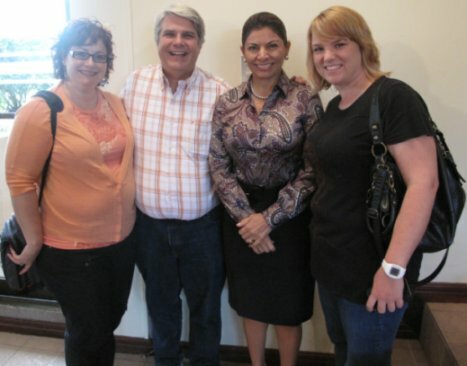 During our visit to this wonderful country, we actually got to meet the President, Laura Chinchilla Miranda! We were touring the main governmental building in San José and were allowed into a press conference that the president was having. It was all in Spanish, of course, so I didn’t understand a word. However, I will have to say that I was incredibly impressed with how the president handled herself. A member of the press would ask a 1-2 minute question, and the president would reply with a 5-10 minute answer. She did this with no notes or teleprompter. She had two advisers with her (the Vice President and her press secretary), but she rarely referred to either of them. My impression was that she was giving detailed answers to the questions off the top of her head. It was definitely a lot different from the kind of press conferences U.S. presidents give! After the press conference, the president was kind enough to come down from the stage and meet us. She even let us take a picture with her (shown above). When I told her what an honor it was to meet her, she told me (in perfect English) that it was an honor for her to meet me. Obviously, she was simply being gracious, but once again, I doubt that I would see such graciousness from a U.S. president. While I know nothing of her political stances, I have to say that after that day, I became a fan! Of course, the most important things to see in Costa Rica, at least from my point of view, are natural. This is an incredibly beautiful part of the world, and we spent a lot of time there simply enjoying God’s creation. We soaked in hot mineral water from a volcano, marveled at the gorgeous mountains, and swam in the deep blue ocean. We also went on a hike in Manuel Antonio, a national park. With the help of an excellent nature guide, we saw some amazing things. A red-eyed tree frog sleeping during the day. Consider, for example, the picture on the left. That green blob on the underside of the leaf is actually a red-eyed tree frog. 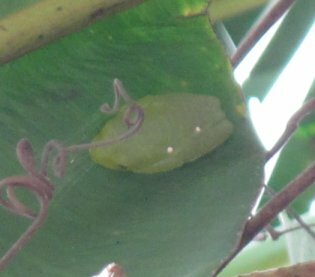 It is nocturnal, so during the day, it sleeps on the underside of a leaf. It tucks its legs and feet (which are usually colorful) under its body so that it blends in well with the leaf. While you might think those two bright dots are its eyes, they are not. If you look closely at the bottom left of the blob, you will see a large dark spot. That’s one of its eyes. The bright spots are just skin markings that shine brightly in the camera’s flash. In normal lighting, they look simply like flaws in the leaf and help the frog blend in. 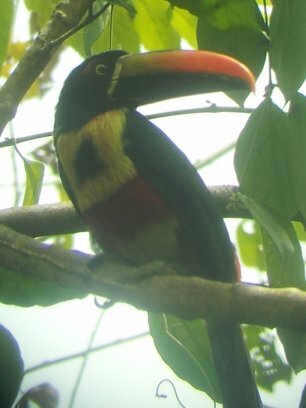 A Collared Aracari, which is a species of toucan. As you might expect, there are a lot of beautiful birds in Costa Rica. The picture on the left is of a Collared Aracari, which is a small toucan. The band across its belly and the nice, distinct spot on its breast mark this as an adult, since those features are not nearly as noticeable in juveniles. It takes an expert to tell the males from the females, because they look very similar. I have no idea which gender this is. Interestingly enough, not only are the males and females similar in appearance, they also have similar duties. Each of them takes part in incubating their eggs and rearing their young. Of course, the monkeys are the highlight of Manuel Antonio, and they were lots of fun to watch. We saw many white-headed capuchin monkeys. They were rather accustomed to people, so they got pretty close to us. Indeed, we watched one of them steal a container of orange juice from a sack that had been left on the ground. The monkey then scampered up into the trees, opened it, spilled a lot of it, and managed to drink some as well. 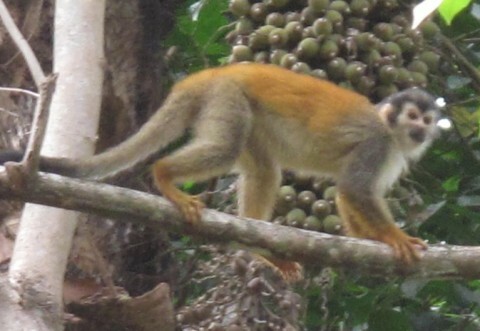 The monkeys I found most intriguing, however, were the squirrel monkeys, such as the one shown below. They weren’t nearly as accustomed to people, so they didn’t get very close to us. However, they were amazing acrobats. They ran amongst the tops of the trees with ease, and they made some spectacular jumps, landing on thin branches that bowed under their weight but never broke. Costa Rica is an awesome place to visit. It is clean, significantly less poverty-stricken than many Central American countries, and simply gorgeous. In addition, it’s pretty close. We spent only five and a half hours in the air to travel from Central Indiana to this tropical paradise. 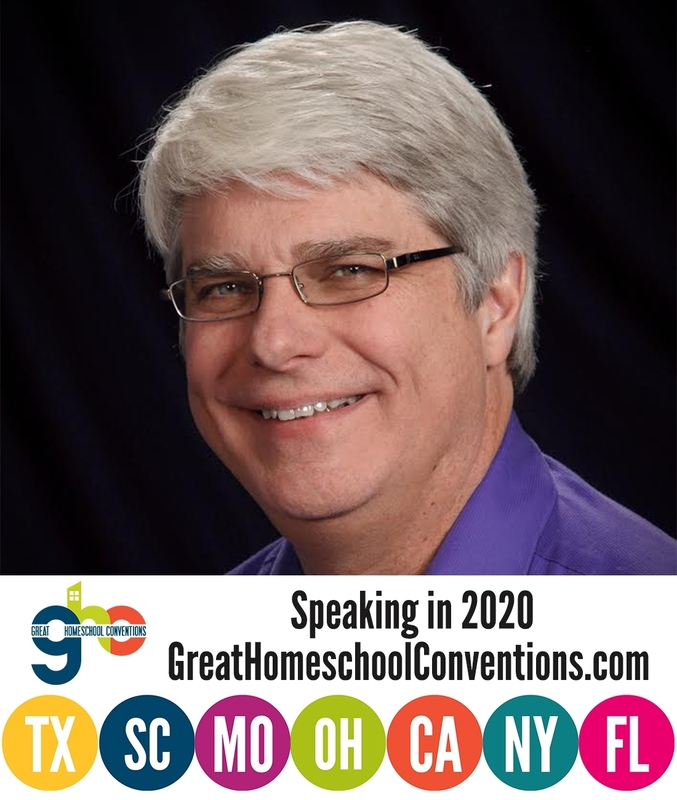 If you go to only one Central American country, go to this one! Last time my parents went to Puerto Rico,leaving us home with my older sister, my younger sister lit our rocking horse on fire. Not every nine yo would know what that meant. I was stuck in Puerto Rico during the suspension of air traffic right after the 9/11 attack, Grace. It seemed okay, but I just wanted to get home. I am glad you liked my country (and the queso palmito), there are much things to see here. For example in a clear day from Chirripó (our highest mountain), you can see both the Pacific and Atlantic ocean. Volcanoes are as close from downtown San José as 30 minutes. As our President every tico is very friendly, that is the way we are. I loved your country, Eduardo. You are quite right – every tico I met was incredibly friendly! Wow, what an incredible trip! And you had the opportunity to meet the president! That’s pretty amazing. Wow, your deductive reasoning about the president’s press conference is amazing! Sarcasm. With the proper training, the monkeys you saw could conduct a press conference. And it’s nice you like to travel where poverty is more hidden. I bet you wouldn’t like to walk through Gary, Indiana, would you? Garypolitans wouldn’t be as nice as ticos, that’s for sure. But maybe that’s because you would never spend any money there. It’s not that the poverty in Costa Rica is hidden, Mia. There is just a lot less of it, and what is there is not as severe as it is in other Central American countries. Of course, poverty in the U.S. is a step WAY above poverty in Central America.